Chic and contemporary restaurant Seasons opened a couple of months ago to great applause – and now it’s just opened its impressive Garden Terrace, which looks out from the third floor of Lee Gardens Two. Open from 5pm each day, you can relax in the serenity of the Lee Gardens enclave in the evening. Apart from signature cocktails served at the outdoor bar, you can also sample delectable dishes from the former head chef at the Mandarin Oriental’s Pierre restaurant and L’Atelier de Joël Robuchon – Olivier Elzer. Lap up his classic French dishes with Asian influences. Don’t get too distracted by the great menu to appreciate the view, though. Shop 308, 3/F, Lee Gardens Two, 28 Yun Ping Rd, Causeway Bay, 2505 6228; seasonsbyolivier.com. 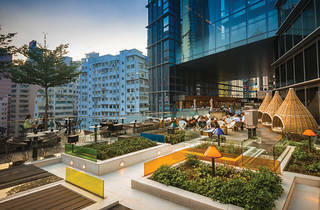 For humorous décor, a tranquil roof terrace, good food and great cocktails, Fu Lu Shou is an autumn alfresco winner. 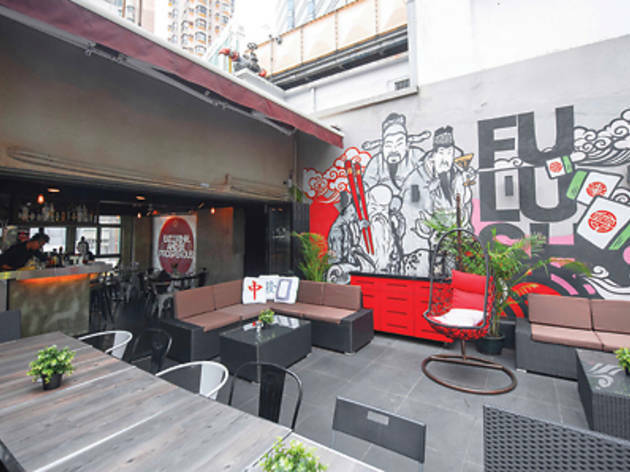 The venue took over private kitchen TBLS’ seventh floor Hollywood Road spot a few months back, immediately making great use of the giant roof terrace by painting a massive graffiti-style mural of the Fu, Lu and Shou deities. And the fun doesn’t end there. The names of the cocktails will tickle anyone who has an inkling of Chinese culture such as the Joh San (good morning, of course…) with its spicy tropical notes, it goes well with items on the menu like kung pao chicken or sweet and sour pork. Hang out among mahjong-patterned cushions here and chat with a couple of friends. 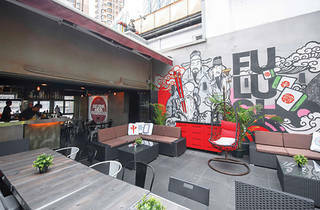 7/F, 31 Hollywood Rd, Central, 2336 8812; facebook.com/fulushouhk. Right next to Discovery Bay, D’Deck is the last word in oceanfront dining. The 180 degree sea vista provides a spectacular view and the international array of restaurants here offers almost every kind of cuisine imaginable. Located inside a historical Murray House, Mijas Spanish Restaurant and King Ludwig Beerhall both offer alfresco terrace dining that overlooks the picturesque bay. Murray House, Stanley; hongkongstanleymarket.com. The circular podium at Elements is a paradise in the cool autumn months due to the sheer amount of tables that go alfresco and the array of choices in the cuisine. Elements, 1 Austin Rd W, West Kowloon; elementshk.com. The space previously occupied by the Quarterdeck Club at Wan Chai’s Fenwick Pier has been revamped to create Quayside Harbour Front Restaurant and Bar. Dark hardwood floors have been installed, as well as floor-to-ceiling glass doors. 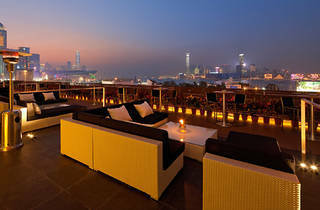 It’s all European chic – and this theme continues to the outdoor terrace which overlooks Victoria Harbour. Even the views of the ongoing reclamation won’t dampen the awesomeness of this sun-drenched area. And with international fare influenced by French bistro techniques like Barbary duck and steak tartare, there’s no end to the enjoyment of soaking up the autumn rays here. Fleet Arcade, Fenwick Pier, 1 Lung King St, Wan Chai, 2661 6708; quaysidehongkong.com. 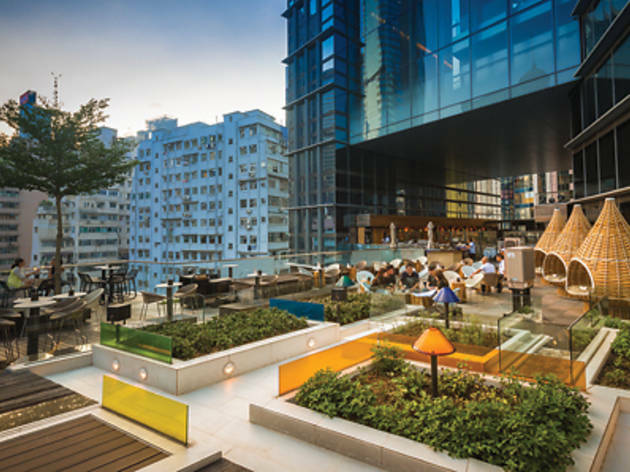 Although The Chop House isn’t the only establishment that sits on a terrace in Causeway Bay’s new Soundwill Plaza II Midtown, it is the largest and probably most notable. The casual dining restaurant is airy and light, with a semi-outdoor bar that opens up on to a third floor terraced seating area, offering a relaxed alfresco dining experience. 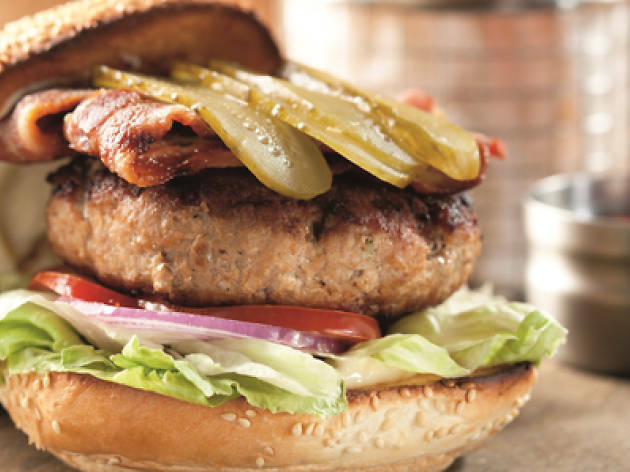 Enjoy excellent steaks, burgers and pastas, as well as the stars of the show: the self-service draft beer taps on the larger tables. Buy a debit card from the bar and refill your glasses with Tiger or Heineken at sunset as you watch life pass effortlessly by over the Canal Road Flyover. 3/F, Soundwill Plaza II Midtown, 1 Tang Lung St, Causeway Bay, 2771 3177; wooloo-mooloo.com. 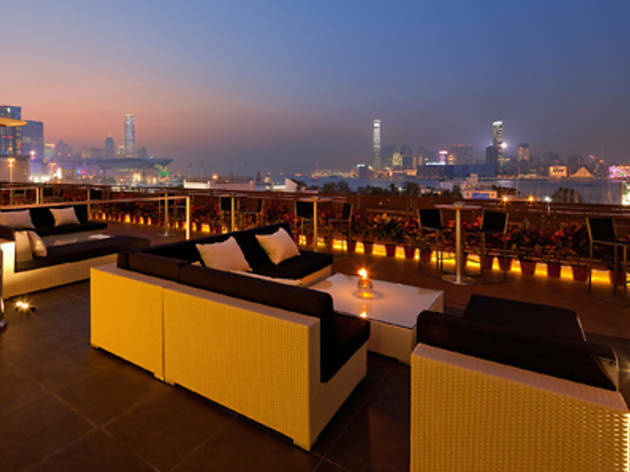 Recently refurbished, Hooray offers a stunning view of the Hong Kong skyline. Kick back and relax on the spacious patio, where good food and great atmosphere mingle. P502, World Trade Ctr, 280 Gloucester Rd, Causeway Bay, 2895 0885; jcgroup.hk. An open-concept restaurant, where you can watch the chefs in action as they sizzle, bake and grill their way through the traditional Italian menu. 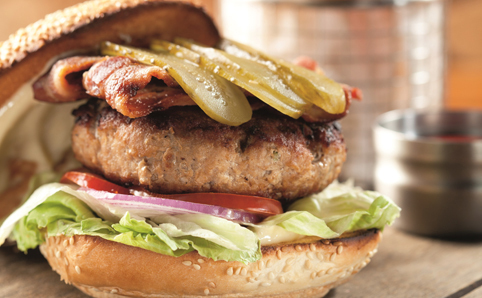 Have a three-course set for lunch or treat yourself to a romantic dinner. 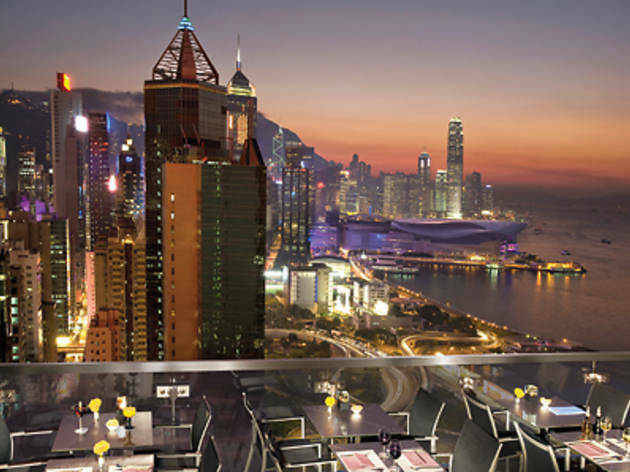 3/F, IFC mall, 8 Finance St, Central, 2383 8765; gaiagroup.com.hk. 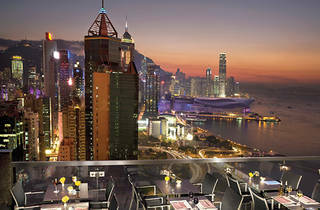 Overlooking Victoria Harbour, this restaurant provides one of the best views of Causeway Bay. Sunday brunch with free-flow is always an event. 34/F, Excelsior Hotel, 281 Gloucester Rd, Causeway Bay, 2837 6786; mandarinoriental.com.